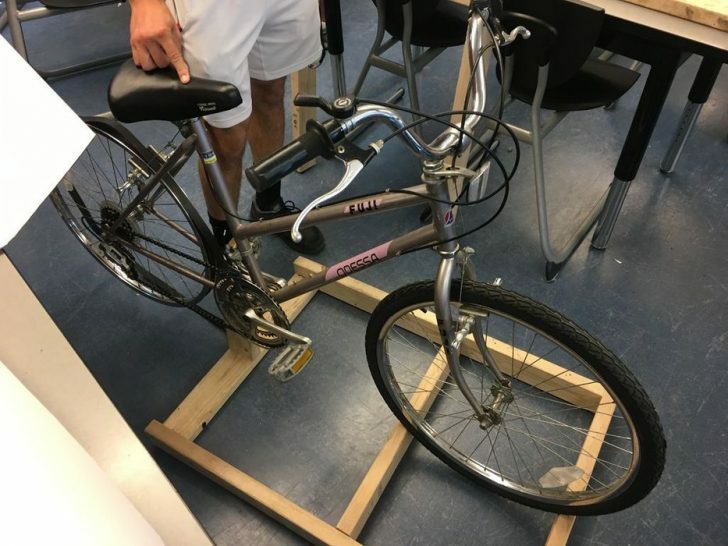 The Instructable user henrycaleb wrote a guide on how to create bicycle powered generator using a bike, an alternator, a car battery, a belt, and a wooden frame to connect all of the components together. Drive belt (big enough to fit your back wheel and to have enough space for the alternator). Depending on how many ribs are on the pulley of the car alternator, acquire a drive belt that can fit it (3 ribs on the alternator = 4 ribs on the drive belt). 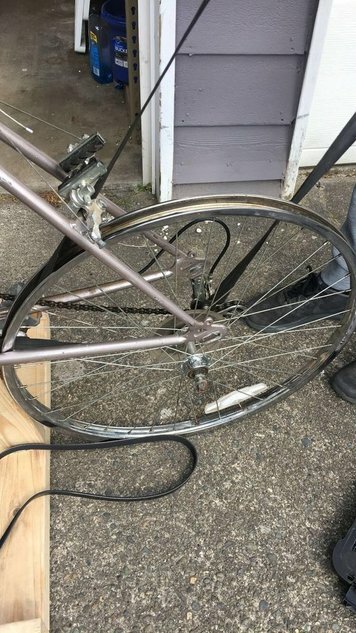 First of all, remove all of the bolts from both sides of the wheel, and remove the wheel from the bike. Next, you will have to remove the tire from the rim. To do that, create a space between the tire and the rim with any flat object and move it around the wheel. Carefully pry the wheel from the rim. Now, you can wrap the drive belt onto the rim. Make sure it leaves enough space to insert the alternator to the drive belt. 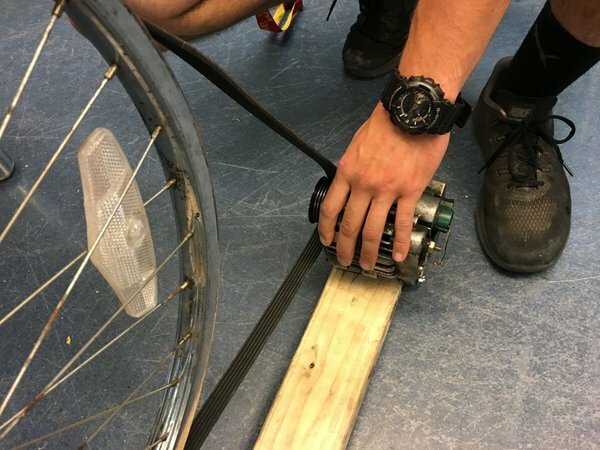 Put the wheel back into the bike (you can use a ratchet to put the bolts back in easier). You should start by measuring the length of your bike. 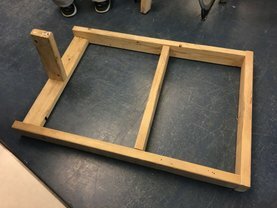 One 2×4 piece of wood should be that length plus an additional 1 foot, in order to make a more secure framework. The width of it should be about 2 feet. 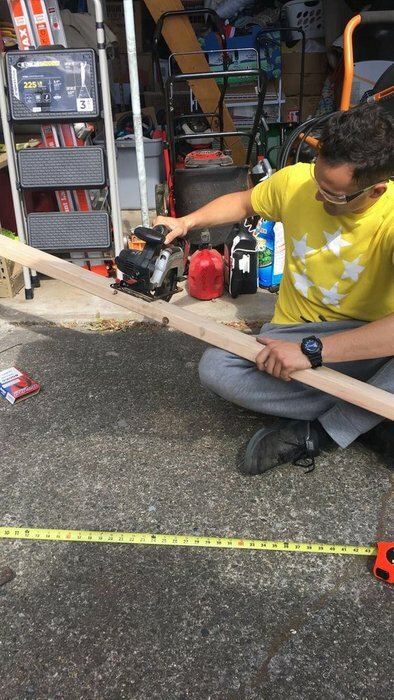 You will need 4 pieces, so cut them of 2 feet of 2×4. This will help you to create a better structural integrity of the framework. You will need a spot on the belly that can be attached to the framework. 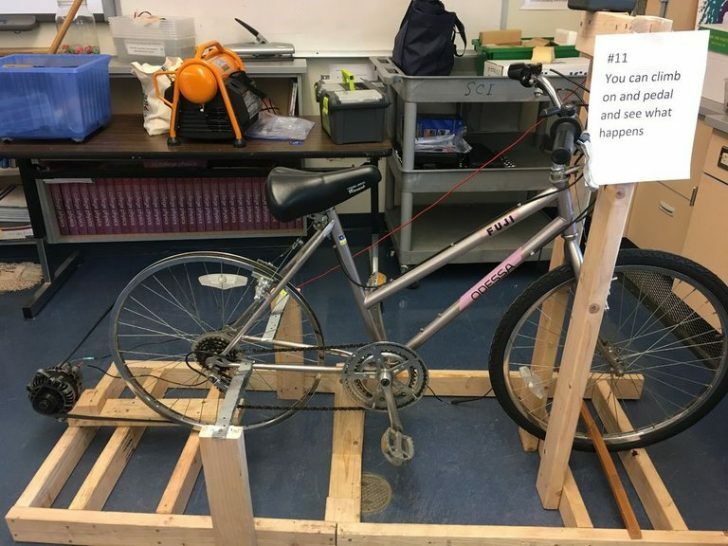 Your bike can have it, and, if not, create it. 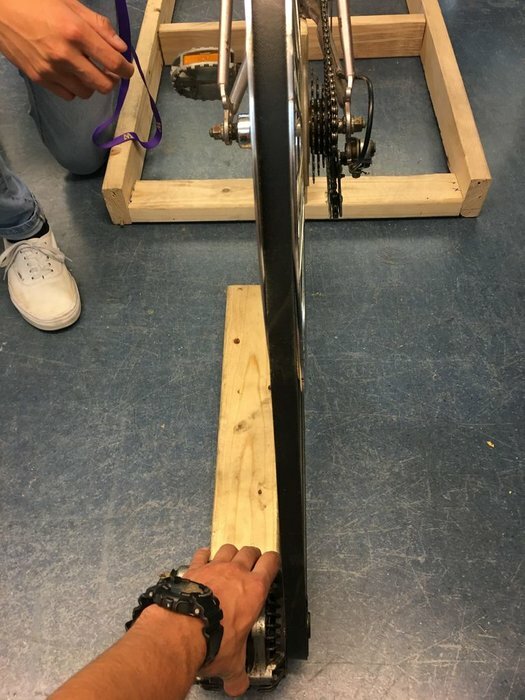 You can screw an additional 2×4 beam into the middle cross-section of the frame and the part of the bike. 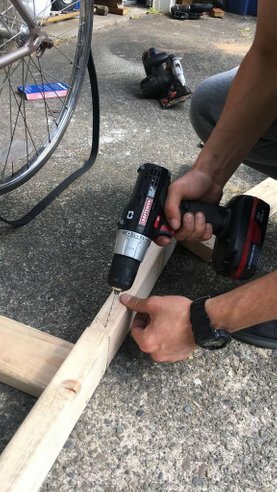 To secure that the future bicycle powered generator is in place, use multiple screws. 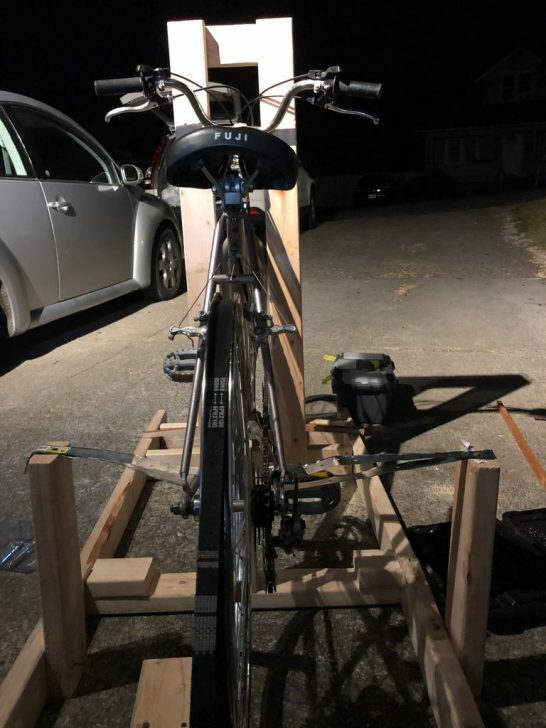 Additionally, you can use extra wood to make the bike more secure and balanced. First, connect the remaining length of the drive belt to the alternator pulley. 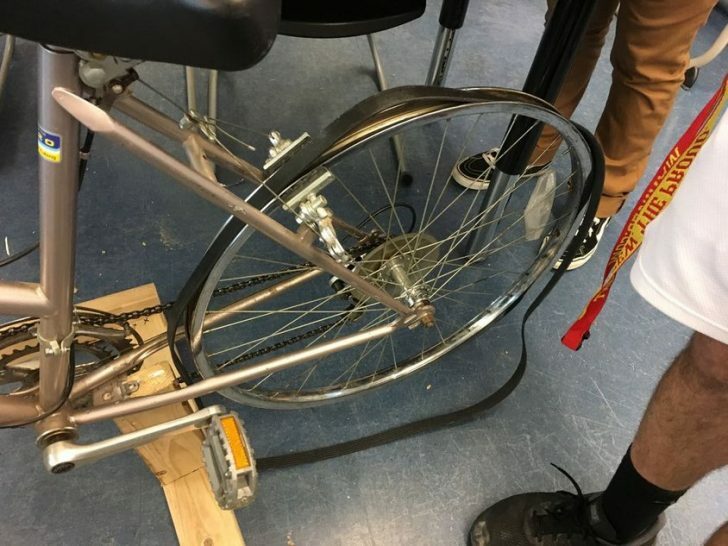 Next, pull the alternator away from the bike, until the belt is fully stretched, and measure how far it is to the cross-section of the framework. 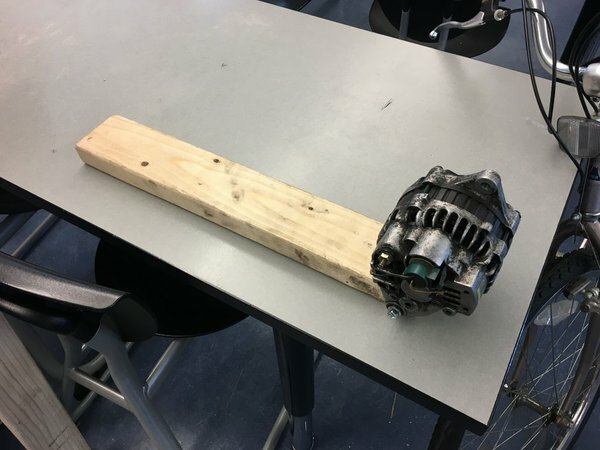 Cut a piece of 2×4 wood of that length, and attach the alternator to it by fitting the later snuggly onto it. Bolt the alternator to the end of the wood. The alternator should be facing the right way if the pulley side of it is on the right side (if looking from the bike). 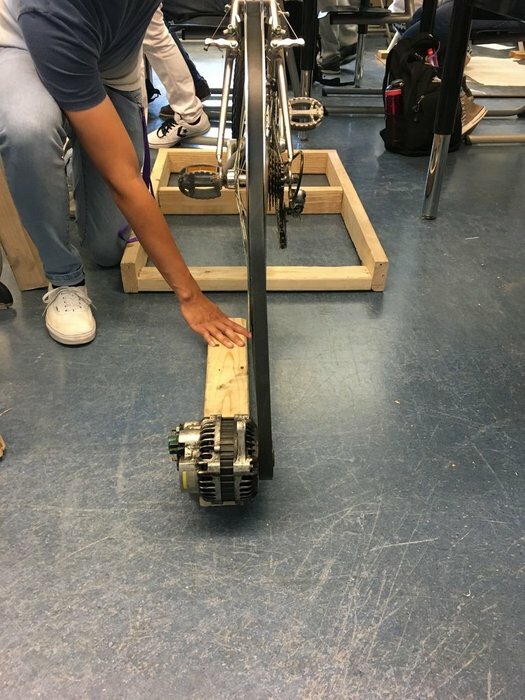 Align the piece of wood with the alternator on it so it is perfectly parallel and lined up to the bike wheel. It should be touching the wooden framework so it can be ready to be screwed in place. If not, then you have made a mistake in Step 4 or/and 5 and you will have to do them again. Finally, if everything is alright, screw the alternator and wood piece to the framework. Now you can wire the alternator to the car battery and attach that to the inverter. This will invert the AC from the alternator to DC in the inverter. Test out the bicycle powered generator by plugging the necessary electronics to the inverter’s power outlet.